Automating valves is something that I seem to be most remembered for sometimes with customers. Not the “You started up that project for us on short notice,” or “That valve worked great that you recommended”. It is more like, “I remember you automated those filter valves for us,” or “I remember you fixing that valve for us that was acting strange by working on the actuator. 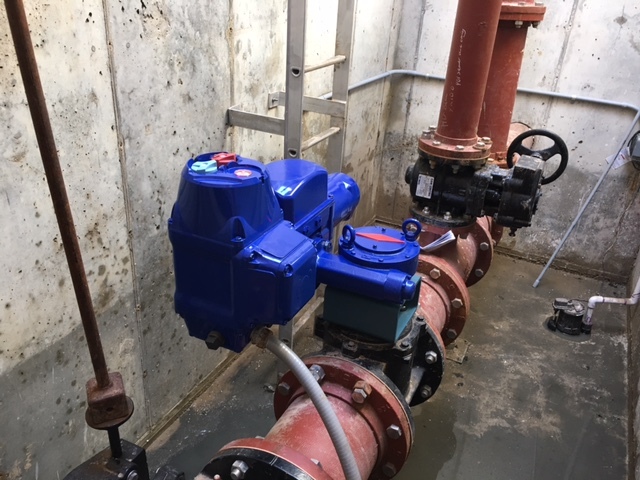 Actuators can be tricky, they can be expensive, and there are so many things that can go wrong if you don’t know what you are doing. I know what I’m doing and I will still run into a mystery every once in a while. Automating a valve is taking something that opens and closes with a manual gear box, and instead controlling it with electricity, air supply pressure, or hydraulic power (internal or external). It is an art as much as a science, so experience with different manufactures and how things are typically done is very helpful. Since this blog isn’t going to teach you how to automate a valve, what I do want you to know are the basics of defining what you have and what you want to do. How does it move? Determine if the thing you want to operate opens linearly (like an elevator or garage door) or does it have a rotational action (like a quarter turn butterfly valve or merry-go-round). What power is available? Electricity has voltage, phase, and frequency. Air supplies have pressure (psi) and flow available (SCFM). Hydraulics can be clean water from the system or a fluid power unit. We just need to know how to power the actuator action. What control do you want to have? Open/Close or Throttling/Modulating. What signals can you send to control it, and what feedback do you want? Getting these three parts of the puzzle together is a huge step in determining a plan to automate a valve. We can make sure the system has enough power to do what you want it to do, and figure out internal decisions of the actuator, but we need to know your goals and what you have to work with. Designing a plan to automate a valve takes communication back and forth to narrow down options and come up with some plans for you to choose from. Please contact me if you have a valve you are trying to automate, and you have questions. Please work on those questions, or at least have them in mind. Any person working in the field of automation has to be patient and have the heart of a teacher. You want to get it right the first time, because it is too expensive and tiring to do it twice!